Waterloo – Thanks to $500,000 in funding through the national Queen Elizabeth Scholars program, Wilfrid Laurier University will consolidate its position as a global research leader in food security while scholars from lower- and middle-income countries and Canada will have an opportunity to build their research capacity. 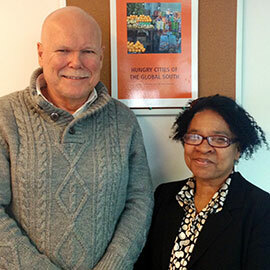 The project, which is tied to the Hungry Cities Partnership co-directed by Laurier Professor Jonathan Crush (pictured with current Hungry Cities postdoctoral fellow Mary Caesar), will over four years help 28 advanced researchers – PhD students, postdoctoral fellows and early-career researchers – gain international research and practical experience. “This is a real boost for the university and our attempt to position Laurier as a global thought and research leader in the area of urbanization and food security,” said Crush, who is Centre for International Governance Innovation (CIGI) Chair in Global Migration and Development at the Balsillie School of International Affairs and a professor in Laurier’s School of International Policy and Governance and Department of Geography and Environmental Studies. Of the 28 participants, half will be Canadian scholars who will have an opportunity to undertake research in South Africa, Mozambique, Kenya, India, China, Jamaica or Mexico. The other half will be scholars from those countries who will have an opportunity to conduct research in Canada. The Queen Elizabeth Scholars program has existed since 2012 and has enabled Canadians, primarily undergraduate students, to engage in cross-cultural exchanges throughout the Commonwealth. Laurier’s Human Rights and Human Diversity department, for instance, has an internship program in Ghana funded through the program. The new Canadian Queen Elizabeth II Diamond Jubilee Advanced Scholars Program, however, is the first to focus on doctoral students, postdoctoral fellows and early-career researchers. Advanced scholars participating in Laurier’s program will be associated with the Hungry Cities Partnership, which focuses on relationships between urban food security, migration from rural to urban areas, global governance, and informal food systems and their regulation. Participants will spend two-thirds of their time on their research and a third of their time with a non-academic placement partner such as a non-governmental organization, private company or international organization. Scholars coming to Canada will undertake placements with CIGI and the Toronto Food Policy Council. This practical experience will help participants think about governance challenges and ultimately help them apply their learning in their home cities, said Crush. In addition, the global nature of the network will help developing scholars learn to work differently. “Most postdocs and students tend to work in a somewhat isolated fashion. This program actually embeds them in a global consortium. In addition to their own contribution to the project, they learn about a way of doing research on a larger, more collaborative scale,” said Crush. There have already been scholars from Hungry Cities partner cities coming to Laurier, as well as Laurier scholars who have gone to partner cities to conduct research and participate in workshops. The new funding, however, will allow for significantly higher levels of international collaboration. The Laurier-led program’s partners in Waterloo are the Balsillie School of International Affairs and the University of Waterloo. Participants will be based at the Balsillie School and University of Waterloo scholars will be eligible to participate.